Do you have to be a Buddhist to meditate? What will meditation do for me? How much time will it take? Should I listen to music when I meditate? Is meditation about making your mind go blank? What does this practice do? Why the emphasis on concentration? How long should I meditate each day? What if I find it hard to like myself? Should I pick the same person every time? What’s meant to happen in stage two? What if I don’t feel much? Is it okay to do stage two first? What methods can I use? Why do we have this stage? Having trouble feeling much for a neutral person? Is there anyone I shouldn’t pick? Why develop metta for a bad person? How can all beings be well when they have to destroy each other to live? How does mantra meditation work? How is mantra meditation used? Why reflect on these facts? How can meditation help with depression? Why teach meditation in prison? What does Wildmind do in prisons? Available from Amazon or Indiebound. The book’s title describes a daunting challenge. For our aging to have the blessing of bringing us wisdom – who does not wish for this? Most of us, by the time we have reached middle age, have had up close experiences with the aging of family and friends. We know that aging brings many guaranteed changes, most of which are unwelcome. We understand that decline and losses are inevitable as we age. And we have learned that wisdom and aging have at best an uncertain relationship with each other. No matter how much we hope and imagine our aging will be graceful and will be touched by the hand of wisdom, we all, when we find our attention unable to be distracted from the reality of our old age, disease, and death, wonder with trepidation what truly lies in wait. So this book’s title is easily heard as holding a kind of promise. Not only is it possible to age with wisdom, this book will tell me the way. Aging with Wisdom is not a how-to book. It is, as promised, a record of Reflections, Stories and Teachings. These reflections, stories and teachings are the very personal ones of Ms. Hoblitzelle. The people we meet, their stories, the experiences described, all have a richly personal intimacy. The reader is kindly and deliberately invited into her world of encounters with truly remarkable teachers, family and friends. Indeed, at times the writing is framed as if in a personal conversation as the “dear reader” is asked questions or commented to directly. Sometimes this works successfully, sometimes it has an awkwardness as we can never quite forget that the people and experiences of her personal world are quite different from those in our own. The experience of aging is woven skillfully throughout the various lives we come to know, and throughout the reflections, recollections and hopes that are shared with us. This is a high accomplishment. A book whose focus is on old age, disease and death goes right against the three things, as is written in Buddhist teachings, “the whole world wishes to avoid”. Yet this book addresses all three directly, fearlessly and engagingly. Drawing the reader’s direct attention to the losses, real and threatened, that aging brings is done in a respectful, even gentle way. It contains no harsh truths or face-slapping realities of the effects of aging. The tone is one of encouragement; a reminder that our life experiences have value if appreciated rightly. The adventure of our facing our own aging and death honestly, as with other great adventures we have endured, will require openness, learning from others, humility, and courage. The author, and the people we meet in the book — the “Wayshowers” — exemplify why this adventure can be a worthwhile one. The “Aging” referred to in the title is quite straightforward. The “with Wisdom” is less so. This may be because aging can be defined with some easy, specific, and generally agreed upon understanding. Defining wisdom is more slippery. Most dictionary definitions include in their definition of wisdom some combination of “knowledge”, “experience” and “judgement”. Thus we have the Oxford Dictionary definition of wisdom as “the soundness of an action or decision with regard to the application of experience, knowledge, and good judgement.” Aging certainly brings with it experience. An increase in knowledge (general or specific) usually accompanies experience, so a natural connection exists. But judgement? The relationship between judgement and experience is not straightforward or predictable. The same for the relationship between knowledge and judgement. Aging with Wisdom leaves the wisdom aspect turbid. Sometimes the wisdom seems to be used in the more generic “counsel of elders” sense. At other times, particularly with the personal stories and with the “Wayshowers”, the wisdom seems to be of a more spiritual nature, having to do with a sense of inner peace or clarity. In Buddhist traditions wisdom usually refers to a deep understanding of “things as they really are”. In other spiritual traditions wisdom may have other meanings, for example in Abrahamic traditions it may be accepting the will of God. So the book leaves a question about the nature of wisdom and its relationship to aging. Does aging courageously and with full attention to declines, losses, diseases, death mean one attains to a kind of wisdom? 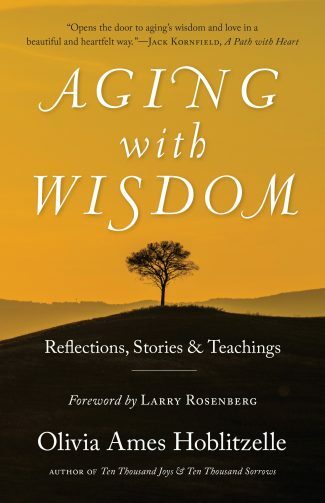 Aging with Wisdom is a book well worth reading. It turns our attention squarely to our own thoughts, associations, images, worries, and confusions about our becoming old. And to our own death. It does so in a way that is gentle, compassionate, kind and fervently personal. It gives inspiration and encouragement. Any reader who receives this from a book has a been given a rich and rewarding gift. Vidhuma (Dr. Paul Shagoury) is a practicing Buddhist and psychotherapist practicing in Manchester, New Hampshire. He and his wife are both members of the Triratna Buddhist Order.